Welcome to the website of The Royds Lodge No. 1204. The Royds Lodge was consecrated in Great Malvern on Monday 30th December 1867 by V.W.Bro. John Baker, the Deputy Provincial Grand Master for Worcestershire, and entered as number 1204 on the register of the United Grand Lodge of England. 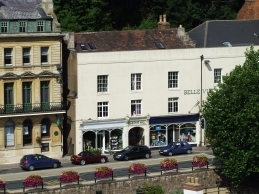 Our regular meetings were first held at the Belle Vue Hotel, before moving to the Imperial Hotel and later to the former hydropathic bath house in College Road, which is a private house and still called 'Royds Lodge' today. In 1911, the Lodge took over the lease of rooms in what had been the Belle Vue Hotel on Belle Vue Terrace, which included the billiard room and an adjoining dining room. These rooms are now known as Malvern Masonic Hall and our first meeting was held there on the 9th January 1912. Our Lodge takes its name from Albert Hudson Royds, the Provincial Grand Master for Worcestershire from 1866 to 1878. Albert Hudson Royds' youngest son, Edmund Albert Nuttall Royds, was a founder member and invested as our first Junior Warden in 1867. We meet in the Province of Worcestershire. We welcome visiting Masons and applications from Masons who wish to join our Lodge. We also welcome expressions of interest from those who wish to learn more about Freemasonry in general, or about The Royds Lodge in particular. If you experience any problems viewing our site, or have any questions about its composition, please contact us.